Ayana Resort & Spa in Jimbaran Bay, Indonesia. 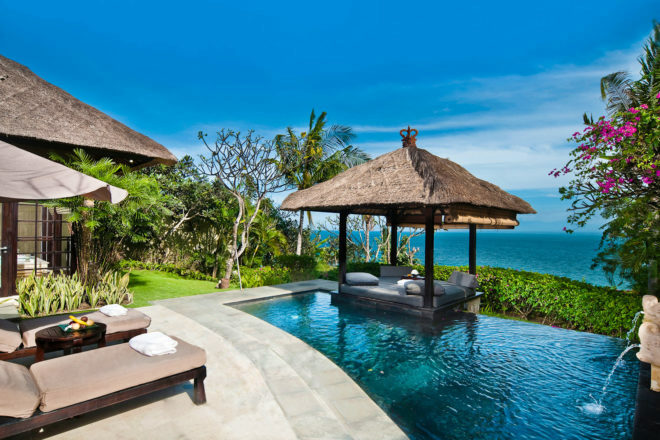 On the craggy limestone cliffs of Bali’s Jimbaran Bay, Ayana is a labyrinth of suites and villas, bars and restaurants, tiny temples, horizon pools and beach cabanas. The gardens are tropical and impossibly lush. It’s modern but imbued with traditional Balinese spirit. There’s always frangipani in the air, open-air pavilions and the tinkling sounds of gamelan. The spa is brimming with body and soul-restoring treatments. But best of all, the cliff-clinging Rock Bar is rock-star ready – the place to watch those tropical sunsets. Did you know You can leave a lasting legacy to Bali’s environment by planting a sapling, which Ayana’s gardeners will nurture and monitor. They’ll even send quarterly updates on its growth.